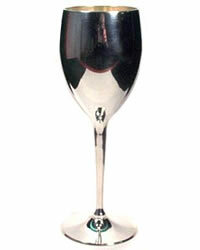 Great selection of silver plated cups, glass goblets and chalices for multiple uses either for home or ritual use. What a fine set of 2 Brass Chalices. Chalices are in a velvet box. They are 6" tall and 2 1/2" diameter. A great set and storage case too. 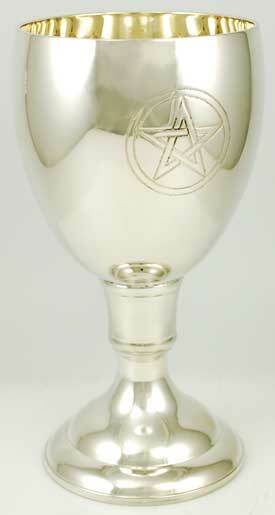 This is a Brass Set of 2 - 7.5" Pentacle Chalices in Case. Golden color and 7.5" tall, in a blue velvert case. 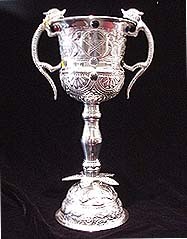 Cup exterior has engraved design; cup interior is silver plated. 5 3/4" high. Plain cup exterior with silver plated cup interior. 7 1/2" high. 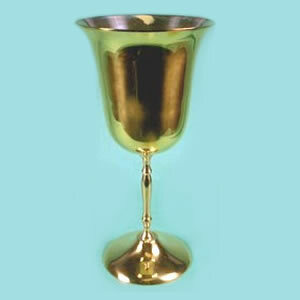 Plain silver plated chalice for all your ritual needs. Stands 8" high. 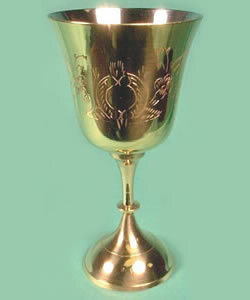 This is a 5.5" Dome Top Triquetra Chalice. A traditional and pleasing design. Brass with Silver Plate. Chalice: Giant Jeweled Pentacle Chalice 14"
Chalice: Grand Jeweled Pentacle Chalice 10"
Large Celtic Pentacle Silver Chalice 8.5"
Pentacle & Triple Moon Goddess Chalice 8"
Fairy / Faery Pentacle Chalice 8"